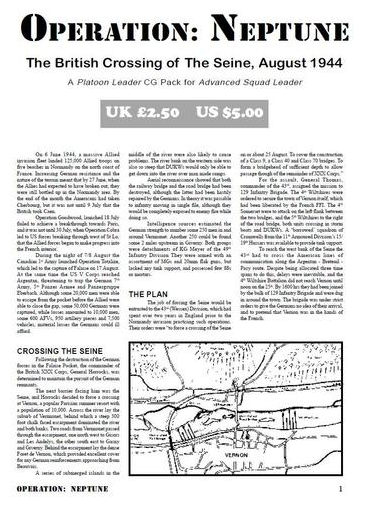 Operation Neptune is an Advanced Squad Leader Platoon Leader campaign game featuring the assault crossing of the Seine in France 1944 by the British 43rd (Wessex) Division, opposed by the German 49th Infantry Division. The game includes the Campaign card, colour overlays for the village of Vernonnet, historical notes and comments by a playtester. In addition to the counters, you need ASL boards 2, 7 and 19 to play this game.